Acne is a common dermatitis in teenagers. The led treatment also called photomodulation offers excellent results to treat acne problems. It works during the infectious phase to dry out blackheads but also after treatment to improve skin quality and avoid scars. Acne is a dermatological condition that mainly affects the skin of the face. It usually occurs in adolescents but can also occur during pregnancy. Comedones or pimples are caused by excess sebum, most often of hormonal origin, which clogs the pores of the skin. Acne is caused by the infection of these blackheads with a bacterium called Propionibacterium acnes that causes inflammation of the tissues. While acne is not particularly severe, it is a very debilitating disease that can lead to depression and loss of self-confidence. Since acne is a bacterial disease, to treat it, it is necessary to eradicate the baccilliform bacteria that cause the lesions: Propionibacterium acnes. Completely painless, photomodulation can be used as a complement to prescribed treatments without the risk of side effects. It is a non-invasive method that consists of applying coloured light to the skin of the face. Numerous scientific studies have demonstrated the effectiveness of the wavelength corresponding to blue (450nm) as a natural treatment for acne. Light penetrates the skin inducing a different reaction depending on the colour used. 1- During the eruptive phase, you will first use the blue color for its antibacterial and antiseptic properties. Photomodulation will allow you to get rid of the bacteria that cause acne, taking the problem at its source. You will complete your session with a red led treatment to reduce inflammation of the skin. 2- Once the skin is cleansed of the bacteria, the red leds help to heal the lesions, thus limiting unsightly scars. To treat an acne problem, the combined use of blue and red during the same session is essential and guarantees rapid results. HOW DOES A LED TREATMENT FOR ACNE WORK? In pathology, the association with LED treatments in the blue spectrum can bring a definite benefit such as in acne for example. In an in vitro study, an anti-inflammatory effect by decreasing IL-1 and ICAM-1 and an anti-infective effect by increasing a LL-37 cathelicidin peptide were found in addition to the known effect of blue LED (405-420 nm) on coproporphyrin III from Proprio bacterium acnes. These results were confirmed in vivo by using only a device emitting at 410 nm. The LED emitting in blue for the anti-infective property and in red for its anti-inflammatory property can provide a solution in case of a therapeutic impasse. What are the advantages of photobiomodulation? LED photomodulation makes it possible to rehydrate and tone the skin in depth, to repair skin damaged by sun, tobacco, stress and to soothe and strengthen in addition to laser treatments or peelings. LED promotes collagen production by stimulating the activity of fibroblast cells in the dermis. The action of light on acne produces fast and long-lasting effects. It helps to erase all traces of acne. It also helps to delay the effects of skin ageing in the long term thanks to a deep action. 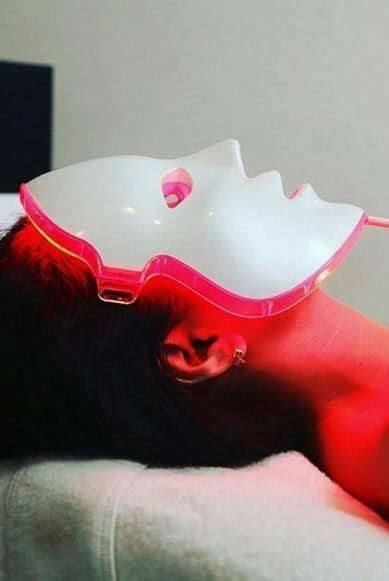 LED is an ideal complement to other aesthetic medical techniques, such as botulinum toxin, hyaluronic acid, radiofrequency, laser and intense pulsed light, peelings, etc.